You say you want bold solutions that unite us: start by fully legalizing marijuana. 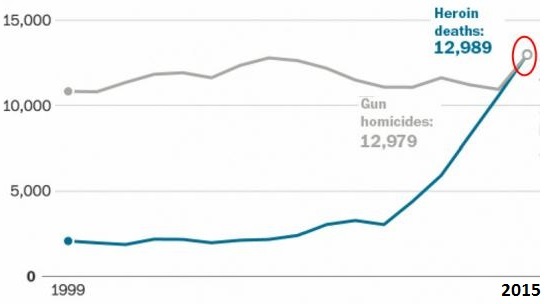 If there is anything the left and right, progressives and conservatives, and everyone in between can agree on, it's ending the counter-productive, destructive "war on drugs" that has generated crime and violence, a "we're number one in Gulags" prison complex and pushed people into harder, far more dangerous drugs (see chart of "legal" opioid deaths below). Dear President Trump: if you're truly serious about lowering healthcare costs and stemming the rising tide of opioid addictions and death, then fully legalize marijuana via executive order now. The usual justifications for continuing the criminalization of marijuana have moved from threadbare to completely disconnected from reality. We're told that marijuana is surrounded by violence--well duh--the violence is the direct consequence of Prohibition. What happened when alcohol was prohibited? Crime and violence exploded around the production and distribution of the outlawed drug. What was peaceful when legal becomes violent when outlawed. This is so obvious, yet we have "leaders" who are blind to the dynamic. By outlawing medical marijuana, we have pushed everyone with chronic pain into extremely addictive and increasingly deadly "legal" opiates. This is the height of insanity: outlaw natural substances with pain management potential while legalizing highly addictive and often deadly synthetic opiates. Legalizing marijuana would eliminate the violence, lower the costs of operating the Drug war Gulag and lower healthcare costs by reducing the dependence on addictive opiates for pain management. Yes, there are circumstances that require opiates--but does it make sense to make opiates the next step above over-the-counter pain relievers? The social, human and financial costs of the opiate pandemic are skyrocketing. Adding marijuana products to the spectrum of choices would reduce these costs and the death toll. Regardless of whatever critics may claim about the negative effects of marijuana, the truth is death by marijuana overdose is essentially non-existent. Compare that to the tens of thousands of deaths caused by "legal" opiates and the millions of lives destroyed by the "war on drugs" and its American Gulag.While those benefiting from operating the "war on drugs" and the American Gulag propagandize a completely false pathway from marijuana to opiates, the reality is grandmothers are benefiting from medical marijuana and it is the sick-care/Big Pharma cartels that are the pathway to opiate addiction and death. Dear President Trump: you say you want bold solutions that unite us: start by fully legalizing marijuana. Listen to your young advisors and those in law enforcement who see the counterproductive insanity of the "war on marijuana" first-hand. Listen to the elderly who are benefiting from medical marijuana. Do the right thing and fully legalize marijuana. It's time to move beyond addled fictions and deal with the ugly realities of a system that actively promotes "legal" opiate addiction and death while outlawing marijuana.